The United States today appears to be on a permanent war footing. U.S. troops remain in Afghanistan and Iraq in a never-ending “nation-building” project. The U.S. conducts covert and overt military operations throughout the Greater Middle East and Africa. The U.S. maintains about 800 military bases in over 70 countries. The U.S. military budget is larger than that of China, Russia, Saudi Arabia, India, France, United Kingdom, and Japan combined. Most Americans as well as both major political parties have come to accept this outsized military role in the world as normal and necessary. To understand how the U.S. arrived at this permanent warfare state, it is helpful to travel back a century to examine how and why the U.S. became involved in World War I. This war was significant, among other reasons, because it helped give birth to the military industrial complex and dependency of the U.S. economy on military spending; because it was underlain by secrecy and an elaborate propaganda campaign of the kind we have also seen in our contemporary era; and because it established the ideological formula for justifying U.S. foreign policies and wars that has continued to the present. the struggles of the peace movement to maintain U.S. neutrality, resist militarism, and survive wartime repression. 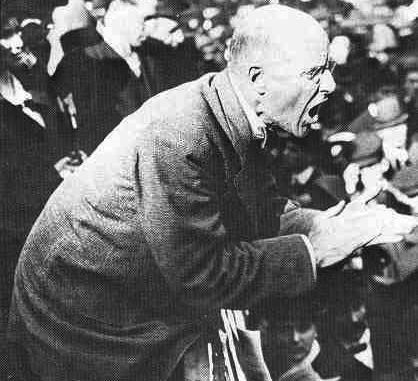 One example of the wartime repression was the conviction of Socialist Party leader Eugene Debs under the Sedition Act for telling a crowd in Canton, Ohio, on June 16, 1918: “… it cannot be repeated too often – that the working class who fight all the battles, the working class who make the supreme sacrifices, the working class who freely shed their blood and furnish their corpses, have never yet had a voice in either declaring war or making peace. It is the ruling class that invariably does both. They alone declare war, and they alone make peace.” Debs was sentenced to ten years in federal prison. You can hear actor Mark Ruffalo give the entire speech on the 100th anniversary of the speech by clicking here. As with all the essays on the website, the essay on U.S. participation in World War I is written for students and the general public. It is introduced with a 12-point “Did you know?” section to stimulate interest. It is organized thematically, with each section containing subheadings to highlight main issues. The essay includes 163 images to enliven the narrative and offers occasional summaries when a complex set of factors is discussed. Extensive endnotes allow for verification of information and identify primary and secondary sources. Additional resources are noted in a linked Resource page, which also lists the number of pages in each section of the essay, should professors, instructors, and teachers wish to assign all or part of this 62,500-word essay. Information about the value-based perspective of the website can be found on the Home page. The website is unique in seeking to integrate three academic approaches: progressive “revisionist” history (critiques of foreign policy), interdisciplinary peace and justice studies (normative value orientation), and global/international history (non-nationalistic perspective). Its purpose from an educational vantage point is to assist in the cultivation of critical evaluation skills, such that questions of right and wrong, truth and lies, justice and injustice are not excluded from curricula but placed at the center of discussion and debate. I hope that educators will find the essays useful in this regard. The U.S. Foreign Policy History & Resource Guide website is sponsored by the Peace History Society and the Historians for Peace and Democracy. This is a series of one-page, printable handouts that summarize important historical events, movements, crises, and more that form the backdrop for our current political situation. In April 2017, the Historians Against War was renamed the Historians for Peace and Democracy. A new policy statement was adopted focusing on the the dangers of war abroad and the threats to democracy at home. Join Historians for Peace and Democracy. Sign Up as an H-PAD Campus Contact! Click here for internal area for SC members.